Okay. I'm nuts about zucchini. Totally and completely crazy-pants for zucchini. 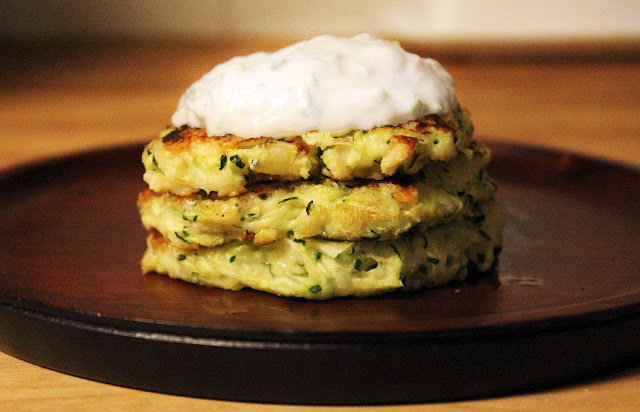 I have been trying to build my zucchini repertoire and found some inspiration in these fritters. We ate them tonight with some grilled chicken and topped with tzatziki. I loved them (obviously!) My husband loved them, and our tiny gentleman loved them. Grate the zucchini and let it drain while you as prep the other ingredients. Chop the onion and grate the cheese. In one bowl combine flour, baking soda, cheese and salt. When the zucchini has drained some, using a clean dish towel, wring out the rest of the water. In a second bowl, beat the egg, add onion and zucchini and stir until nicely combined. Fold wet ingredients into flour and cheese mixture. Transfer cooked fritters to the baking sheet and bake for 10 minutes to add crispness. I have seen a lot of recipes for tzatziki that call for the cucumber to be peeled and seeded - I don't do this. I like the dark green skin and since the Greek yogurt can be very thick, I like the cucumber to thin it out a bit. Anywho - combine all ingredients and let this rest for about 30 minutes. I grated the zucchini and let it start draining and then made the tzatziki, then finished the fritters. Everything came together on a good schedule. These would be good with some grated carrots or yellow squash added if you wanted a veggie variety. I don't think you need the egg... I plan to try these again soon without it. Whenever I have the food processor out, I grate extra zucchini and freeze it for later. I add it to soups in the winter, I make zucchini bread and muffins, I will now make fritters.